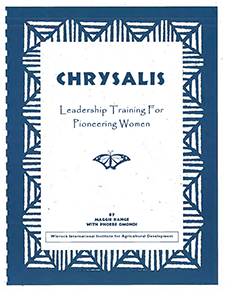 Chrysalis: Leadership Training for Pioneering Women is the cornerstone of Winrock’s Leadership for Change (LfC) program. Developed as part of Winrock’s flagship African Women Leaders in Agriculture and the Environment (AWLAESM) program, LfC is a self-reflective, action-oriented, gender-aware program that improves leadership skills and equips women to drive social change within their communities and institutions. LfC has been adapted in over 20 countries for diverse project contexts and audiences, including men, youth, government institutions, and civil society organizations. Materials available here include the original trainer’s manual and participant action workbook.